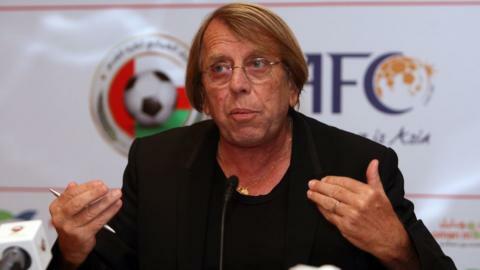 New Togo coach Claude LeRoy has told BBC Sport he is aware he faces a tough job but took it because he wants to revitalise football in the country. LeRoy, 68, has replaced Tom Saintfiet, with Togo struggling in 2017 Africa Cup of Nations qualifying and the country's domestic football in a poor state. He said: "I know it will be difficult; we have only a small chance to qualify for the next Nations Cup and Togo also needs to work on local football. "But I'm happy, I like this challenge." The task appealed to LeRoy to the extent that he ended talks with Tunisia, Algeria and Nigeria over their vacant coaching positions and agreed a three-year contract with Togo after "only a few hours' negotiation" - but only after Saintfiet's departure had been confirmed. "I told them I did not want to discuss the situation before they had an agreement with Saintfiet," LeRoy revealed. "It is always a pity when a coach leaves his job." Togo are third in their Nations Cup qualification group with two games to play and only the winners are guaranteed a place at next year's finals in Gabon. LeRoy feels the best Togo can hope for is to take one of the two places given to the best group runners-up - and the Frenchman knows he must convince talismanic striker Emmanuel Adebayor to commit to the cause. "The key players help the team to get results and win big competitions. I like characters, I like difficult players and I have had a lot of them in my career - starting from Roger Milla (when LeRoy was coach of Cameroon). "But these players I had were also the first ones at training and the last to leave. They worked hard and were at the disposal of the team. "Emmanuel has the potential to be one of the top five strikers in the world; he is powerful, fast, technically at the top level and when he is physically at his best it is very difficult to stop him. "But I want to tell him that nothing is more important then the team, including the coach." Adebayor came out of a self-imposed international exile to play in the 0-0 draw with Tunisia in last month's Nations Cup qualifier. It was his first game since June 2015 and the striker, who is currently with English Premier League side Crystal Palace, has long had a difficult relationship with the Togo Football Association as well as nations team coaches, including LeRoy's predecessor Saintfiet. And following his return to the Togo set-up there have been reports that Adebayor is already unhappy again. "I need to have a big chat with him," added LeRoy. "I like him and I was also very close with him even though I have not been his coach. We have a important Nations Cup qualifier against Liberia in June. "I don't like the term 'star player' because when you see a star in the sky it is completely dark around it. I prefer a player to be like the sun, shining light on all the people around them. Star players belong in individual sport, not in football. I will try to explain this to him." While the immediate task is to try to get Adebayor on side, LeRoy realises that there is much work to be done to ensure a new group of Togolese players will come through to take the place of the 32-year-old and others reaching the end of their career. "Togo has a lot of good young players but we have to solve some problems," said LeRoy, who has coached in Africa for over 30 years and is familiar with the problems at grassroots level on the continent. "I told the Togo FA we need to work on improving local football in the country. At the moment there is no championship, only the Cup of Independence. "They need to start a new championship. I have to find local talent and to work with local coaches to prepare the next generation." Having led Cameroon to the Nations Cup title in 1988 and only once failed to reached the quarter-finals in his record eight Africa Cup of Nations tournaments, few can argue with LeRoy's record in African football. Togo are hoping he still has the magic touch.